On Tuesday (18th July) Vice-Chancellor Professor Helen Marshall visited Buckingham Palace for a royal audience with Prince Philip in celebration of our 50th anniversary. Helen, along with University Registrar Alison Blackburn, Chair in Science Communication and Future Media Professor Andy Miah and Lecturer from the School of Computing, Science and Engineering Neil Currie, had the rare opportunity of meeting with the Duke of Edinburgh to discuss our recent successes and plans for the future. As you may be aware, the Prince has had a long-standing affiliation with the University and was our first ever Chancellor who remained in post until 1991. He spoke fondly of the times he has visited Salford over the years and how impressed he has always been with our strong industry links. The Prince was interested to hear about our growing collaborations in the region, along with our drive for public engagement programmes like the Manchester Science Festival. We'll leave you with this great image Andy took of the team outside the Palace gates which get top marks for aesthetics..
After the 2008 Research Assessment Exercise, the summary report acknowledged the growing volume of practice-based research outputs within the Communication, Cultural & Media Studies Unit of Assessment. It also emphasized the need for practice-based researchers to provide clearer detail on the research process underpinning their work, but questions remain about how any given output should be evaluated. As well, while many departments expressed their investment into practice and theory, practice-based outputs constituted less than 5% of the total outputs submitted across all results. Given the increased use of practice-based methodologies within REF2014 UoA36, how should research outputs like exhibitions, documentary films, media art, or scriptwriting be evaluated by the peer review panels? And how should we account for interdisciplinary practice-based outputs, for example work at the intersections of media and performance or media and music? This free event is hosted by the Creative Futures Research Centre at the University of the West of Scotland, and is co-funded by the MeCCSA Practice Section. It is designed to give peers an opportunity to inform the Research Excellence Framework 2014 in benchmarking quality for the future. Last night, I saw Andrew Dawson's Leitmotif at the Unity Theatre. It was a small crowd - a little too small given the outstanding performance from Dawson. It's the kind of piece which is, at times, abstract enough to provoke the minimally sensitive viewer and accessible enough to engage anyone who ever doubted the medium of performance space. Everyone should see this. The April march in Glasgow against the Iraq conflict has the privilege of being the first substantive entry to this blog. I'm endeavouring to be chronological at this stage, starting with everything so far. I lived just around the corner from where this photograph was taken. 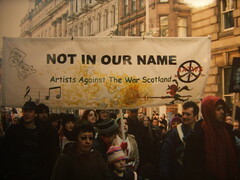 The phrase 'Not in Our Name' reflected the established use of this phrase at the time, which has continued to be used across a number of other campaigns. Here in Glasgow, the police wanted to ensure that protesters did not reach the M8 intersection, so police walls were set up just at the edge of Sauchiehall Street. The west side of this street was packed, but everything was quite civilized, no violence etc. I've still to work out whether this placard ought to have had a stronger design quality, it being 'artists' and so on.